Making An Impact, something we can all do. While having lunch last month with a group of friends, I was once again appalled at the server who set down our water glasses, then haphazardly tossed eight straws on the table for five people. I immediately grabbed the one closest to me, and said loudly to get her attention “PLEASE don’t just drop these on the table, ask if the customer wants one.” Whereupon one of my friends said behind her hand to the server in a stage whisper loud enough for the whole restaurant to hear “just ignore her.” I get it, she believes that one person not using a straw will not make a difference. And, you know, she is right. Only one person doing one thing won’t make a dent in the avalanche of plastic in our oceans and landfills, but a lot of ‘one persons’ can be a force for real change. 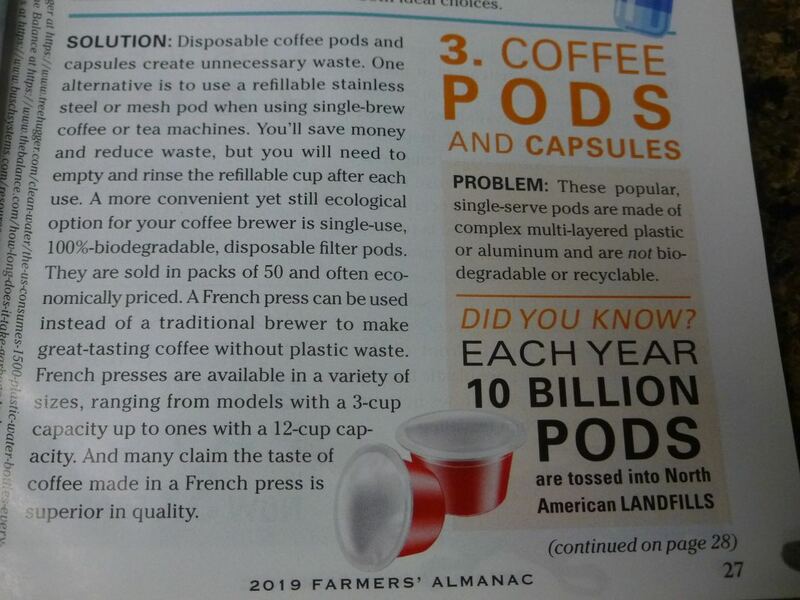 Even my new Farmer’s Almanac for 2019 is taking up the cause! No, I am not saying that you cannot use a straw. If you want one, you should have one. What I am saying is that you should be ASKED if you want one, because many of us don’t. Every item left on a table must be thrown away after the customer leaves, whether it was used or not. So leaving a perfectly sealed straw on the table goes to the landfill, unused. Even worse are the straws put in your drink without asking. Again, the one in my drink will go to a landfill unused. The obsession with the ‘uncleanliness’ of the outside of a drinking glass is just baffling to me. Our immune systems are marvelous things, and can handle most casual contact with bacteria and viruses. Plus, servers are better trained than they were when this all started with a news story some years ago. The same person that is paranoid about the outside of a glass will readily use the plate and fork in the same restaurant that goes through the same dishwasher and is handled by the same people. There is a greater chance that you will get sick from the lettuce on your sandwich than from the dishware. At that same lunch, another friend mentioned that the plastic dump in the Pacific ocean was from Asia, absolving our country in her mind of any responsibility. But, did you know that up until the beginning of 2018, 80% of our plastic recycling was being shipped to China? So much of that huge plastic mess in the Pacific ocean is partly our responsibility. Early in 2018, China passed a new law that their country would no longer accept waste or recycling from international sources. So, we are now going to have to deal with that on our own – 7.3 metric tons of plastic was shipped to China in 2016. But, the US doesn’t have the means to recycle all that on its own at this point, so all that plastic that you thought you were recycling is now going to landfills. I want to give credit to Aurifil – they are supporting an initiative in Canada to create a market for plastic recycled materials, with plans to do more to use and recycle in the future. They promise that the future will see a change in their use of plastics, as they are able to shift over to a different way of making their spools. See the Auribuzz blog Making an Impact for more information. So, what can one person do? Well, lots actually. Begin with asking every restaurant server to ask before throwing straws on the table. Ask for paper straws, or use a permanent one that is washable. At a dinner last week, another friend mentioned that she stopped using straws recently when she realized that the skin around her mouth was developing the creases like a long term smoker from years of straw use. 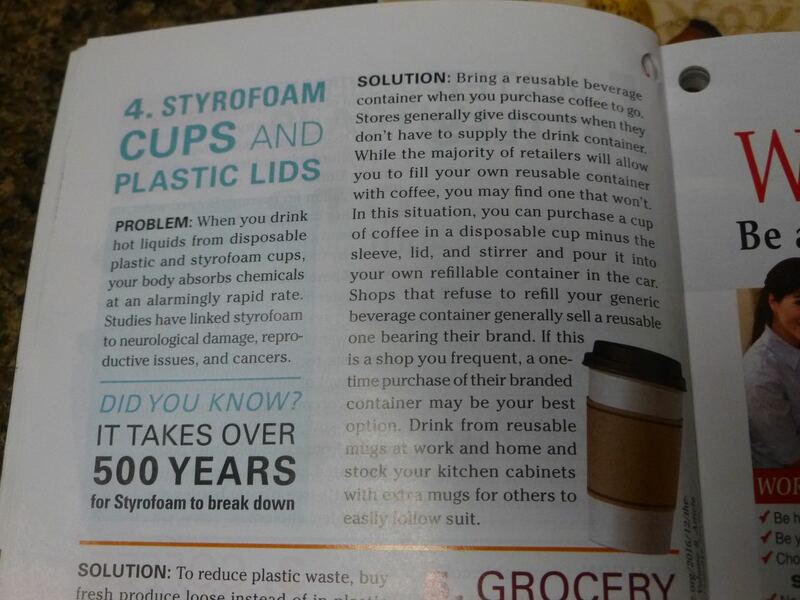 So, another great reason to think about curtailing the use of a straw. 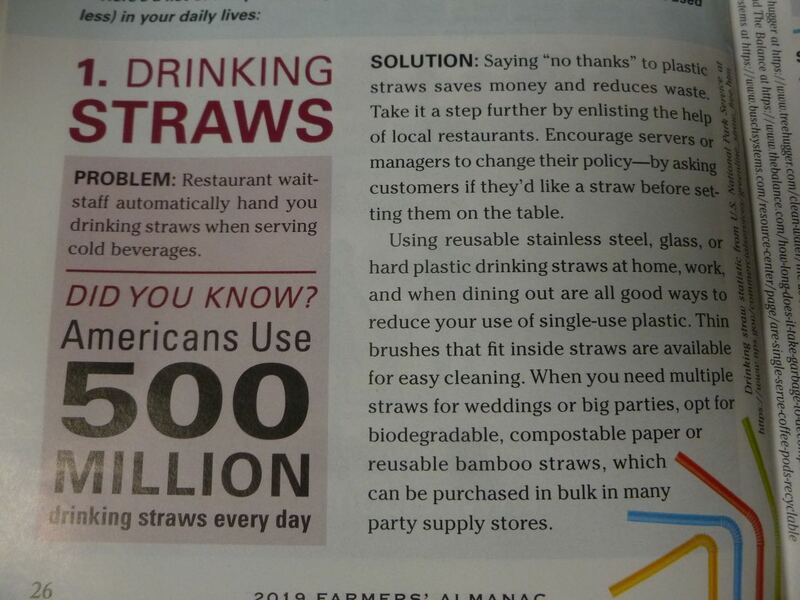 We were enjoying dinner at my favorite restaurant in town, one that has begun asking customers if they want straws and has been amazed at not only the number of people who’ve said no, but the money they have saved. 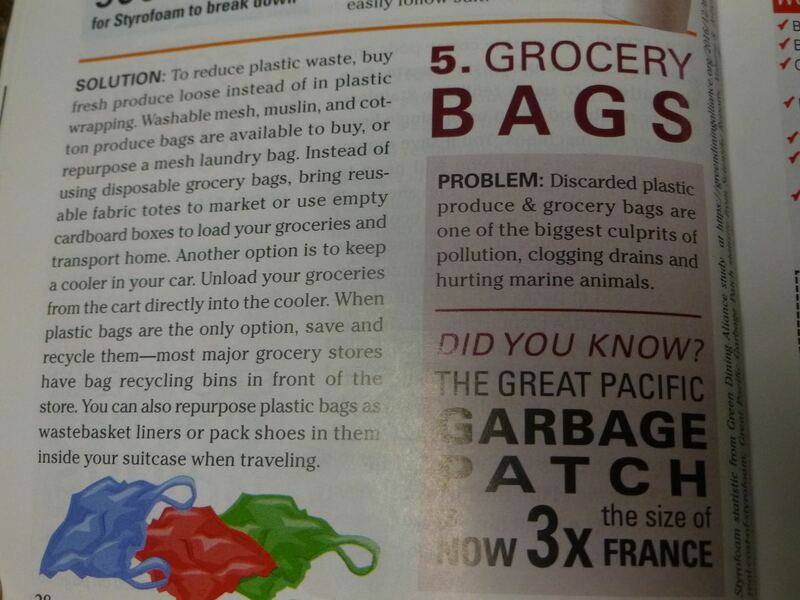 You may already use your own bags at the grocery store, but expand that to every store. Take one into the mall, the department store, the boutiques, the farmer’s market, everywhere you shop. For those who say they need these to pick up after the dog or similar jobs, save your bread and hamburger bun bags, and plastic packaging from toilet paper rolls, paper towels and other household items for this purpose. Put the produce bags back in the car in your own bags and use them for the next round of veggies. When you forget your bags at the grocery checkout, request paper bags that can be used to transport your paper recycling. There’s even a term for this – precycling – meaning not accepting the single use plastic bag in the first place. Recycle appropriately. 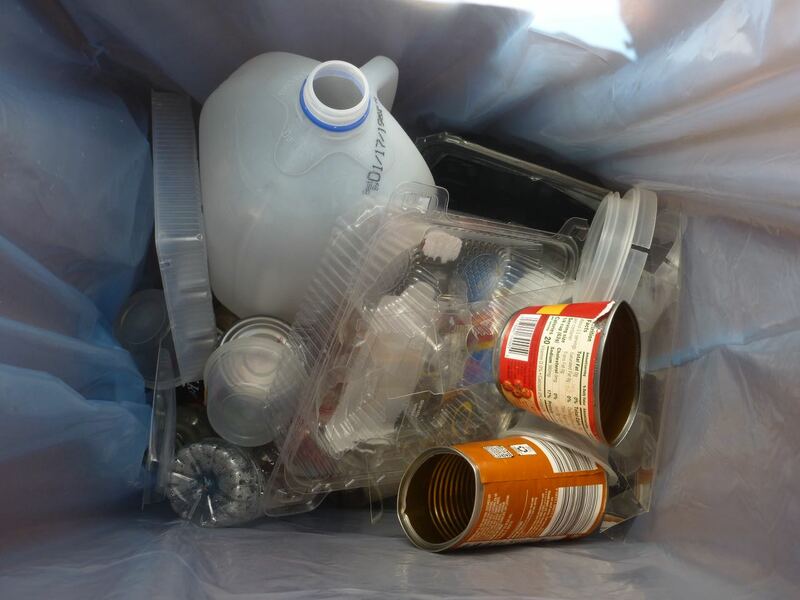 You may believe that if it is plastic, it should go in the recycle bin, but much of what we throw in there is a problem. Plastic single use grocery and produce bags plug up machinery and need special handling, so put those in the bag recycle bin at the grocery store, don’t dump them in with the plastic recycle at home. Clean the plastic of contaminants. Use water bottles that are washable and re-usable. Try not to be a ‘wishful’ recycler, and I am guilty of this one. We often make recycling mistakes that send more to the landfill than we realize. Most importantly, actively look for and buy products made of recycled materials particularly plastic. If we don’t create a market for goods made of the recycled materials, then putting your plastic in a recycle bin is useless. I already love Dream Green, made of 100% recycled plastic bottles. Every pound of Dream Green recycles 10 plastic 2-liter bottles, removing that waste from the landfill. This batting has a soft green color, best used in beige or darker backgrounds, but really doesn’t show through the higher quality white fabrics. It is soft, quilts beautifully, doesn’t crease, won’t hold stains, dries fast and doesn’t shrink. I am so happy to see more manufacturers look at the impact they can have on the environment!! I’ll get down off my soapbox now, but I’ll keep advocating for a greener world. What tips do you have for lowering our plastic consumption? 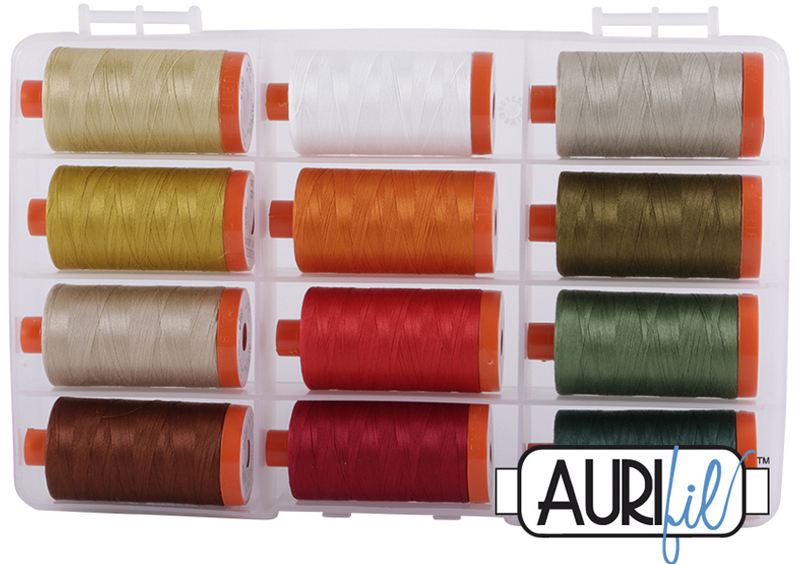 Find Aurifil Thread and Dream Green batting on Amazon. Stay on your soapbox—I’m there with you Each person makes a difference. Please add global warming to your litany. This planet is in trouble. 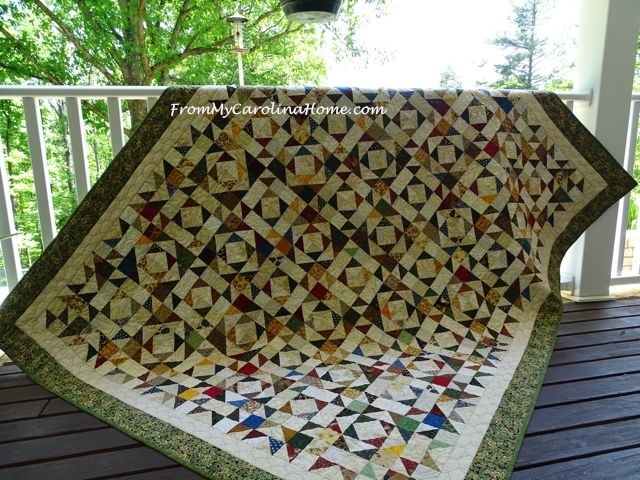 thanks for the info on the Quilter’s Dream – Green batting, I like shrinkage in my quilts as I like the look so I guess I will pass on this one. I am not familiar with the green batting but i will definitely look for it next time. 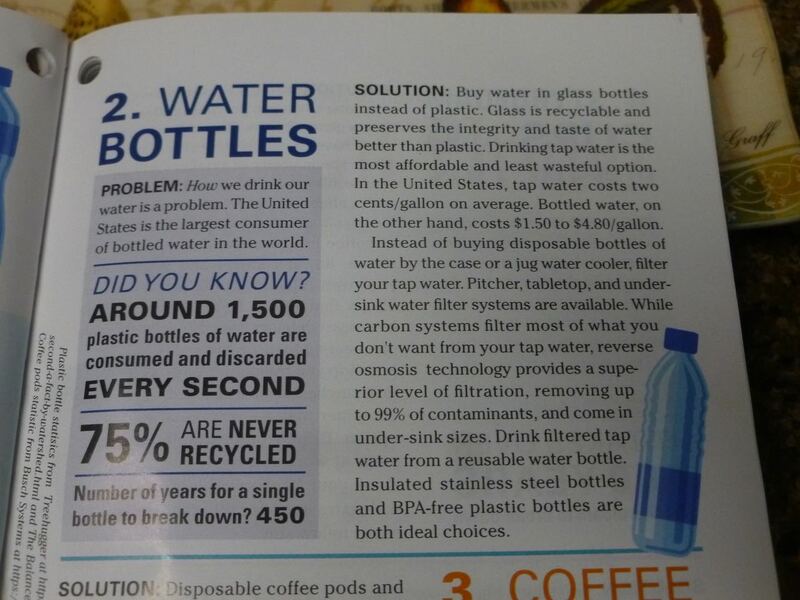 Thank you ….everytime one reads articles like this, it makes them think more about what they are using for products. Let’s hope the US and the rest of the world find ways to recycle all the plastics and mostly start to develope products that can be used in place of them. It does take a village!! Paper bags worked years ago, coffee pots worked years ago and who needs a straw anyway?? I don’t use them at home, why should I use them in a restaurant. Thanks again for the suggestions of new products using recycled materials. I do think that most people forget that recycling starts with reducing the number of recyclables you even use. Reduce, Reuse, and only if you cannot do those, Recycle. Somehow the message has gotten mixed up. Great information, Carole. Thank you! I’ll have to check out that batting too. Thank you for this post. We all need reminders of what’s important in our day to day lives. Our landfill now only accepts water bottles and soda bottles for recycling. I seldom buy bottled water and very rarely soda. I used to wash any other plastics before putting them in the recycling (think milk jugs, fruit containers, etc) but now they want them to be put in the regular trash. Fortunately I live in an area where we have a burn barrel so now I burn them so they are not taking up landfill space. Not sure that is kosher but at least they are not clogging up the landfills or being a danger to the wildlife. The environmental cost of producing paper bags is much higher that plastic bags. Just to distribute the bags, paper takes 7 times as many transport trucks as plastic for the same number of bags. Analyze the process all the way back to cutting the trees and the energy and water required fof paper bags is astronomical compared to plastic. When we make substitutions we have to make honest comparisons. Same goes for the cost of reusable bags. The only real solution is to buy less stuff. I highly recommend the book Junkyard Planet for anyone interested in the topic of reducing waste. When on the beach I like to walk. Pick up trash as I do so. Remember a Texas beach, where I observed wildlife in misery because of the plastic bags, fishing line, etc. they were wrapped in. Much of this was debris thrown away by tourists, but there is also a huge garbage island in the Gulf of Mexico. 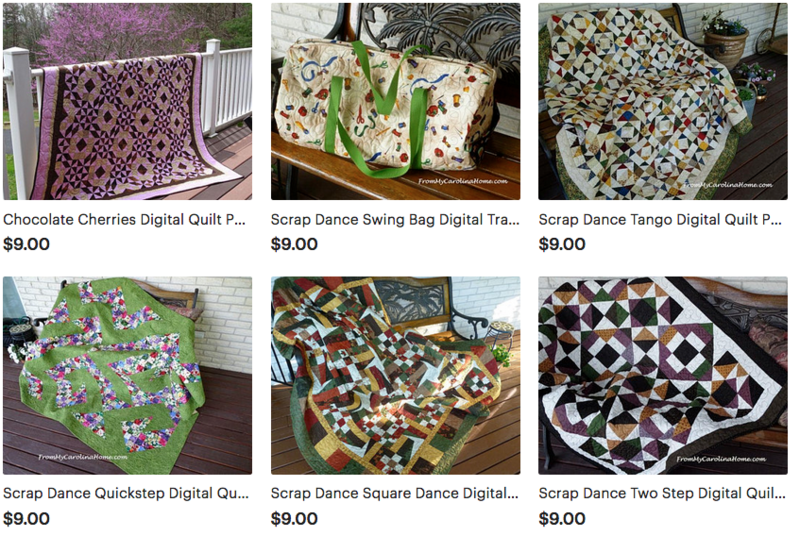 Quilters can make bags to donate to local women’s shelters, food shelves, food coops and libraries to name a few… I see that our local food coop is now selling cloth bags for putting bulk items purchased in. Shopping bulk cuts back on some of the packaging that comes into our homes–and using reusable cloth bags to put those bulk items in makes lots of sense. And I will not get on my band wagon of the huge array of processed foods that take a lot of packaging… All lifestyle choices we can continue to work on. Oh, I can’t wait, your light floral fabric samples even make the anticipation greater. 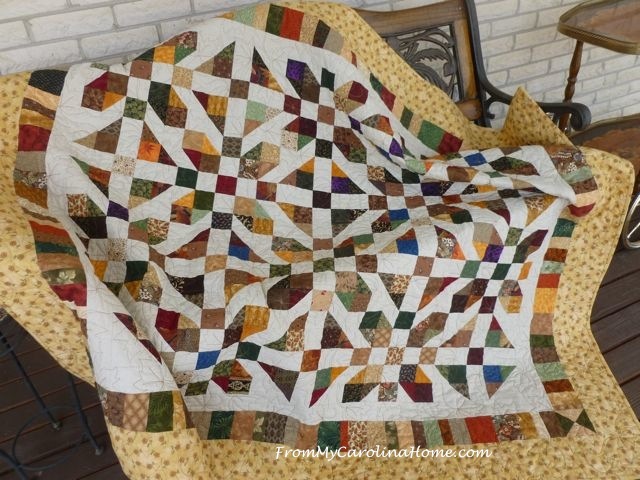 I truly am mystery quilt addicted! But, also can be known as the distracted quilter 👵. Great post! Just had this conversation earlier today. We do all we can and must continue to set examples to recycle. Thanks for staying on the soapbox. Good for you. WOW, what a powerful statement!! I totally agree with you. It starts with each one of us doing our part. We can’t rely on someone else to do all the work. Our supermarkets have stopped supplying plastic bags, but there are still so many products wrapped in it. 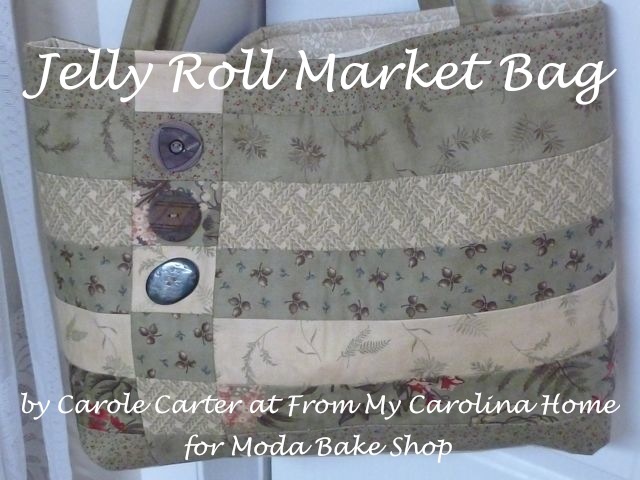 We have fabric bags, of all shapes and sizes, and they are in the car ready to use. All our own tins,paper and cardboard goes to the transfer station. The men there do a wonderful job, as old whiteware, stoves, machines etc, and scrap steel all have a place . A bit like fabric, no waste, as every scrap is used. Speak up every time, is what I think, well done to say that. Wow, thanks for this post. Right on, and has some info (green batting) that I didn’t know about. We all need to be aware of the plastic packaging, single use bags and bottles we grab without thinking. Thanks for pointing this all out. Lots of other great ideas in the comments section too. we rarely go out to eat anymore so don’t run into that. It is sad that our country has not done more to use recycled materials. where I live they make it very difficult to recycle especially plastics. I have been helping a bit with 4ocean they pick up plastics and trash from the oceans and then make into bracelets and donate to nonprofits that help the sea live. Hello Carole, I enjoyed your post today!! There are always ways in which we can do more to recycle and help our world. Just the few statistics you brought up today are so frightening, it is terrifying to think about the numbers involved in so many other plastics. Is Amazon the only place that sells the Dream Green Batting? I would like to try it. 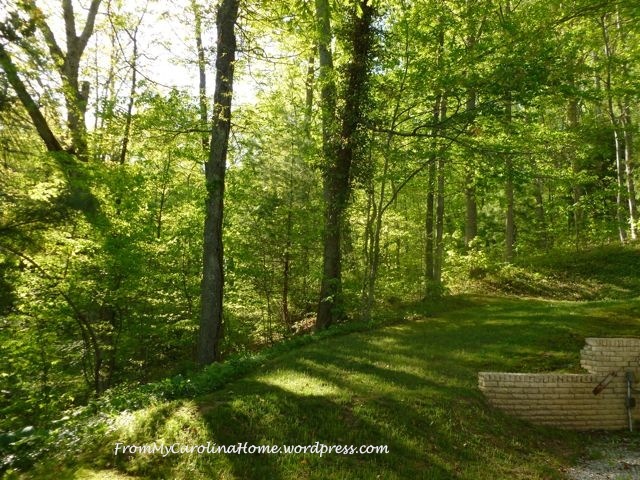 Thank you for sharing this great informative post, Carole! Have a spectacular day! Great post Carole and well done on speakkng up about the straws. Our local supermarket no longer has plastic bags, we take our own and if you forget you can buy a paper one for 25 cents. I have made cloth drawstring bags for the veges and we buy compostable bags for picking up after the dog. I don’t understand the obsession with straws, don’t use them, and I take a reusable cup with me and have my own water bottle…one person can make a difference I believe. Thatnks for the info on the batting. Great Post Carole. If we all can do our bit, hopefully it will help. I know here in New Zealand most supermarkets have stopped handing out plastic bags. We take our own carry bags, and if somehow you forget them, you just have to lay your groceries in the boot ( trunk). There are a few shops still handing out plastic bags, but they usually ask you first if you want one. We have recycle bins as well, and I would NEVER burn plastic as one of your ladies said she does. We also bury all our vegetable ( uncooked) scraps in the garden. As far as coffee cups go….give me crockery every time, and if I have a takeout coffee I have my own cup for in the car. Looking forward to the Mystery….I think. haha! My daughter is a marine biologist so I get regular lectures about all my bad habits and have made a lot of changes. I get paper bags when available and always carry my reusable grocery bins so usually don’t need bags at all. I drink tap water from a Brita, and buy fluids in cartons or glass jars when that’s an option. I use my composter for all table scraps and put the compost on the gardens in the spring. When we rarely need to eat fast food, we get a hamburger at Wendy’s because they have paper straws and paper food containers. We vote with our dollars to buy items in reusable or recyclable products! I’m excited to learn more about the Aurifil project, so thanks for the link! PS excited to see the first notice of the upcoming mystery! In the city next to me, Mountain View, CA, the restaurants have agreed to provide straws only on request. A wonderful idea. My daughter who happens to teach in NM came home last weekend (before MLK day) to check on her depressed mom. She asked if I had a place to store plastic bags. I told her that I store them uner my dryer – one of the newer ones that has the storage under them. She commented that she hadn’t thought about storing them there. She has the same set up. I don’t take all the air out and make them into a small thin sheath like she does. I was shocked that I could still teach her something. As to straws, my gal friends and I still ask for straws at restaurants. I am a cancer survivor and due to that and fibromyalgia, I do have a compromised immune system. I do not hesitate to send back dirty place and silverware either. I expect cleanliness in a retaurant. I do recycle my can (pop and vegetable, etc.) and my plastic. Our city does not recycle yet on trash pickup. One of my gal friends lives in tulsa which does, so she often gets my recycle and takes it to her house. We are each widows, so usually neither of us enougn to fill the bin. If she hasn’t taken my recycle and my son come from AR on a Saturday, he’ll take what recycle that a recycle place near will take. I think we should be taking care of our planet and everyone should be doing his/her own share to the extent each is physically able. It would be nice if others would step up to help those who cannot. Maybe that’s asking too much. Thank you for informing us of the latest in recycling. I am aghast at what types of packaging is required for goods we buy. I recycle plastic containers by using them for cookies and other goodies I make to share, then ask the recipient to recycle in the same manner….sort of pay forward. Many of my friends like to make cookies and cupcakes, for instance, for our elderly neighbors who don’t bake, or someone who’s recovering from surgery, etc. It’s a nice way to gift homemade goodies while making the request to think about recycling these types of packaging. In CA we have had to bring our own bags for several years, or pay for theirs at checkout. Some stores even give us a nickel credit for every bag of our own we use. As of Jan 1st, it is against the law for a restaurant to bring a straw unless requested. And, They get fined heavily if they just bring them to the table. Of course, they have to be caught! So happy to see this article! Would love for you to post it everywhere!!! 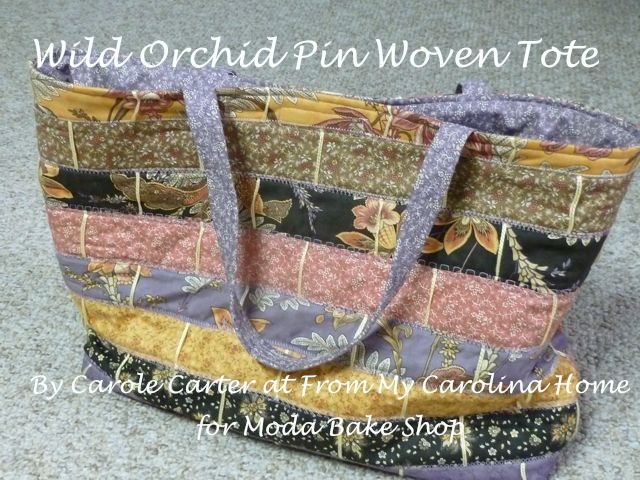 I have been using cloth grocery bags for 4-5 years and recently made cotton bags that fit in my purse. I LOVE my cloth bags- the pasta boxes dont rip them and they hold a lot. The straps are wide and don’t dig into my hands. They are attractive and washable. I am amazed that single purchases are bagged as well as items like a bag of potatos or a gallon of milk. How unnecessary. Yup, I’m up on that soapbox with you. I think that there’s a lot of laziness and ‘can’t be bothered’ out there. So sad. PS the cloth roll up bag is amazing! Look up DogUnderMy Desk patterns. It is a pdf purchase called Retail Therapy. 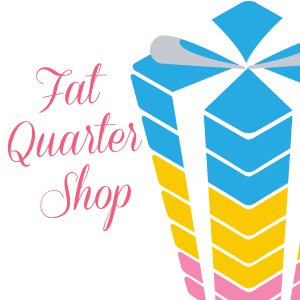 Would be great for your projects for the women’s groups! Sometimes recycling is not feasible – I live in a very low populated area and no one picks up recyclables separately from other garbage. If they tried to do that, they would be burning up so much extra fuel that it would be counterproductive. Recycling also uses a lot of water. 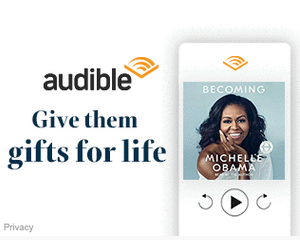 I think the better thing to do is try not to buy it in the first place. Reusable grocery bags, getting a newspaper subscription online, not using paper plates, etc, are all things that make a difference. Our local trash pickup picks up recycling at the same time, so no extra fuel needed. Perhaps you could advocate that your service provider could do the same? I agree, precycling by not using as much as possible in the first place is the best idea. As a few others have mentioned, “stay on your soapbox”! I believe if more people, and my that I mean LOTS MORE, were on “soapboxes”, then perhaps a change could begin to happen. It is so sad to see people turn a blind eye to the damage we are doing to this planet. In my humble opinion, I fear we might be too late to ever get ahead of the damage being done. Thank you for using your blog to bring to our attention a few items which create huge impact on our planet. Eliminating these will of course not solve the issue, but doing nothing will not solve it either! We must all try to lessen our footprint. Loved this column as ever since the first Earth Day I have been very interested in conservation and what used to be called “ecology.” I cringe at ads showing folks using paper towels to clean a spill when a cloth towel or rag that can be tossed in the wash and used again would do the job perfectly well rather than having to buy huge packages of paper towel (some people tell me they use a roll a day, which boggles my mind!). Seems to be a perception that it is “unsanitary” not to use paper items for everything, but for the average person with an average immune system, using cloth towels and napkins in the kitchen won’t make you sick – sometimes I jokingly point out that we don’t throw our used underwear (or bath towels) out every day, so you’re probably safe to use a kitchen towel rather than a paper towel! And, I am so tired of seeing plastic bags blowing all over and plastic water bottles everywhere…not creating trash in the first place is key. I’m now getting pretty good at remembering to specifically ask for no straw when I order cold drinks. I seriously don’t see the difference – germ wise – between a glass and a coffee cup, both washed by the same dishwasher and handled by the same people. No one wants a straw in their cappuccino. It’s taking a long time, but supermarkets here are SLOWLY starting to respond to pressure from customers. The other day I noticed cherry tomatoes packed in a cardboard punnet, instead of the usual plastic – still had cellophane wrapped around the outside, though, but it’s a start. You are so right – lots of littles add up to make a big impact. The Rasant thread I use has a cardboard spool. Off to read the Aurifil article. … and we also face the same problem in Australia, due to China changing its policy on taking plastic waste from other countries.